Scooby Dooby Doo, where are you? We need some help from you now… we have a mystery on our hands! An awesome birthday adventure awaits Scooby-Doo and the gang of kids at this adorably creative party hosted by Summer Stone. (You may remember Summer from the Fashion Fairytale Party we featured last August, and her Eggsactly Perfect baking article from last November). Today, Summer is back to inspire us once again with another incredible party and cake! 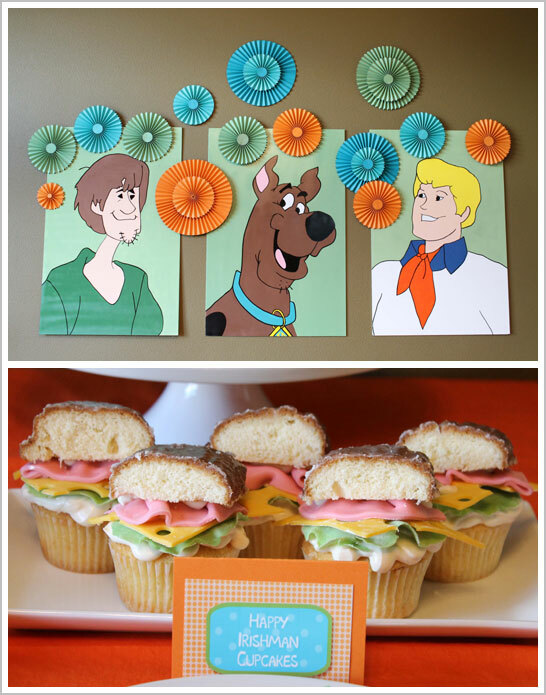 From the hand painted backdrops to the sandwich cupcakes and adorable Scooby cake, this party is fan-tastic! Not to mention the mystery of the missing birthday presents. Zoinks! 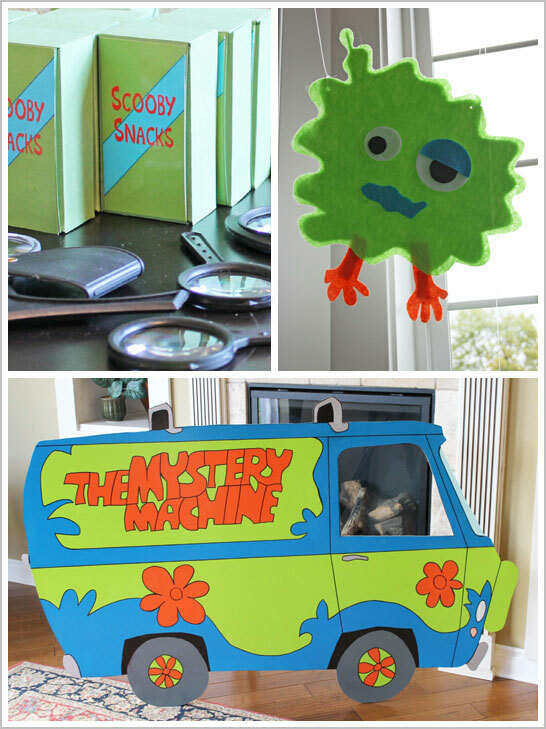 Check out this rad Scooby-Doo Birthday Party! 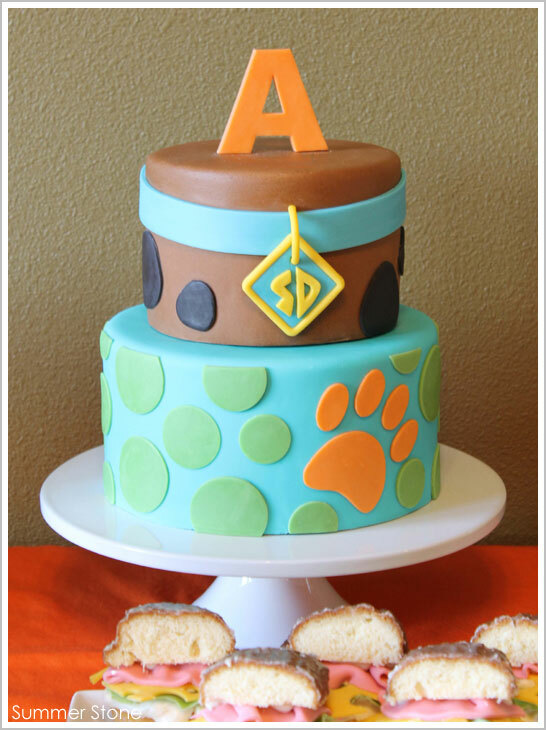 A Scooby-Doo inspired cake that is sleek, modern and perfectly executed! That’s the best kind of character cake in my book! “This party was loads of fun. When the kids came in they were informed that they were in training to become part of Mystery Inc.. They started by creating monsters out of sticker sets to familiarize themselves with the types of villains they may be dealing with. We then had a lunch of sub sandwiches, chips and fruits (just like Scooby and Shaggy would like). In the mean time, my daughter hid all of the presents the guests had brought and we announced we had a mystery on our hands and they needed to help solve it. We then had a shooting gallery made of felt monsters that the kids shot with Nerf guns armed with Velcro ended darts. When each guest shot three monsters they then received a Mystery Inc. t-shirt which my mother and I had made. After that the boys and girls were divided up to look for clues hidden throughout the house with their magnifying glasses. For this, they were given Scooby Snacks. Once all the clues were found, my mom read them to the guests so that they could piece together the mystery. Next, the cake was cut. 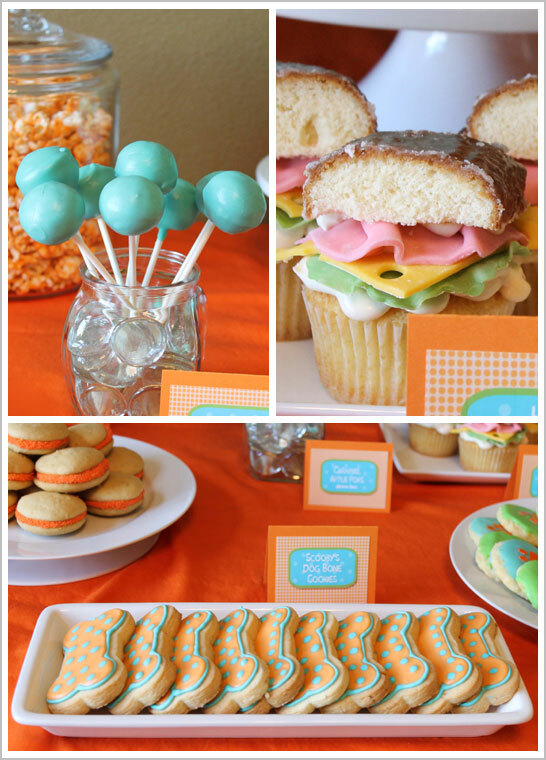 We also served sugar cookies, whoopie pies, sub sandwich cupcakes, candy, candied popcorn and caramel apple pops. The caramel apple pops were made of one green apple Laffy Taffy and two Kraft caramels smashed together and then rolled into a ball and then dipped in candy melts as you would a cake pop. The guests went home with Scooby Doo hand soap, Scooby gummies, crayons and a little Scooby and the Gang coloring book as well as their t-shirts and a magnifying glass. I am in love with this party!! I am swooning over those awesome sandwich cuppies! WOW! Oh my word! This is one of the cutest themes ever!! LOVE THIS! oh my gosh, my kids would love this!! The cupcakes are so cute!! Summer, you outdid yourself!! Looks like a wonderful party. AMAZING Summer!! You always have the BEST parties!!!! You are so talented and sooo creative! I’m also curious how the mystery machine was made. For the mystery machine we projected the image(found from a Scooby font) onto an thin MDF sheet and copied the image then cut it out using a jig saw. We then painted the outined images in various colors and finally outined them in thick sharpie so they would stand out. Good luck! Where did you get the mystery machine? Or what did you do to make it? We are looking for one to do as teachers for out school celebration. I am in love with this idea! How did you do the sub-sandwhich cupcakes? Is the cheese, lettuce, and meat made out of starburst? What flavor of cookie are the whoppie pies and what is in the middle? What an adorable birthday party idea! I just love this! 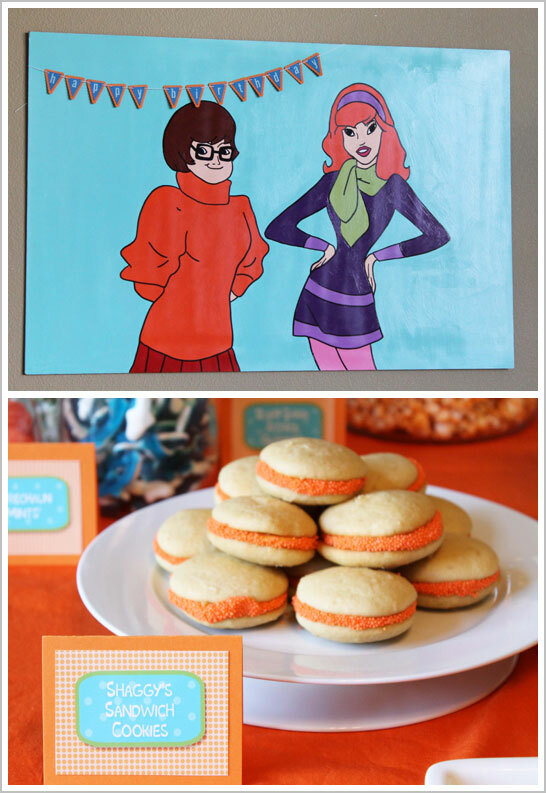 How did you make the Scooby snacks and the food place cards?